After reading the review on MMW about the movie “The Stoning of Soraya M.” I decided to give it a bash, it’s been a while since I’ve watched something worth the reel its embedded on. The movie is based on a book by the French-Iranian journalist Freidoune Sahebjami, who stumbles upon a small village in Iran in 1979, shortly after the Revolution. His car breaks down and whilst waiting for repairs Zahra notices he has a tape recorder and recognises him to be a journalist. She beckons him to her home to narrate the incidents which occured only the day before in the village. And this is where the movie begins. A true life account of Soraya Manutchehri, 35 year old woman married at the age of 13, a mother of 6 children with a husband who actively works at turning their sons against her and is physically, emotionally and sexually abusive with a hankering for prostitutes. Her husband, Gorban-Ali, wishes to marry a younger girl of 14, the daughter of a doctor who is on death row at the prison where he works as a prison guard. However Gorban-Ali cannot afford to keep 2 wives and wants to avoid paying Soraya her dowry if he divorces her so wants her to divorce him. Soraya on the other hand doesn’t want to divorce Gorban-Ali since she would not be able to provide for her children without his financial contribution and would be prone to being harrassed or propositioned, as does the mullah who visits her on saying of Gorban-Ali, to propose she, over time, become his sigheh – temporary wife, or as Zahra, Soraya’s aunt, calls it “his holy whore”. Zahra is an outspoken woman who see’s the religious mullah for what he is; selfish and corrupt and drives him out of Soraya’s home with a good earful of insults. Gorban-Ali knows the Mullah from his days as an inmate, where he was detained for child molestation charges. Zahra is Soraya’s confidante and her well-wisher. When Gorban-Ali’s cousin, Hashem, mourns the passing of his wife, Zahra see’s this as an opportunity for Soraya to generate some income in order to feed her daughters, as her husband refuses to provide any further financial support unless she divorces him. So Soraya goes to Hashems house and does the cleaning and cooking. This is where the trouble begins and the plot her husband spins starts. Her husband, with the support of the Mullah, begin to accuse Soraya of adultery and with abit of co-ercion and threats of causing harm to Hashem’s son, he contributes to the web of lies and soon enough the village comes to hear the rumours. The Mayor of the village, who propositioned Zahra for marriage once but she refused, is advised of the moral crime and holds a tribunal, the panel of which consisted of Soraya’s father, the mullah, her husband and 2 sons. They find Soraya guilty of adultery and put her to death by stoning. Zahra tries to escape with Soraya, but they are trapped in her home as guards have been placed outside to prevent her from absconding. The final scene plays out the long stoning scene, Soraya is put waist high into a pit and then the stoning begins. The first stone is cast by her father, the second by her husband, then Hashem and her sons – after which the rest of the villagers join in. She lies there, after what seems like an eternity of pelting stones at her, bent over in a pool of her own blood. Zahra takes the Soraya’s body but is refused permission to bury her. The stoning scene is long and drawn out, harrowing and disturbing. I personally couldn’t watch the stoning, so decided to just listen attentively to that portion of the movie. There is a strong sense of injustice as Soraya is being stoned, despite being an innocent woman – a woman who was told to prove her innocent and to disprove her guilt, the onus being on her despite the accusations coming from her husband who was known to be a philanderer and of dubious character. Some of the characters are typical, such as the husband – he personifies evil, but Soraya is not the meek quiet woman despite giving off such airs when being taken to the freshly dug pit. You do wish however that she had tried harder to protest her innocence, though would probably have made little difference to such an unforgiving crowd. In the book Soraya has 6 children, mostly in their late teens. In the movie Soraya has 4 children, 2 girls and 2 boys – all young, the oldest being 12. Zahra – an ignorant village woman, who speaks perfect English to the journalist. Why, since the journalist spoke Farsi anyway? The undubious character of Soraya’s husband – why no-one spoke out about his infidelity and sleeping around when he accused Soraya of adultery? The calibre of witnesses and their reputation – surely if witnesses are known to be of shady characte thenr their accusations or testimonies would be put to scrutiny even more so? This wasn’t the case in this movie. The un-veiling of the woman before stoning – they removed her burka and she is dressed all in white, as one is for burial. Refusing to bury the body – you bury the body regardless of what they died of or for. Her being stoned for adultery when she, in the end, was accused of trying to seduce Hashem. In this case, as far as I’m aware, it would be lashings not stoning. I personally don’t think the movie was remotely about the application of Islamic law with regards to stoning, it wasn’t a critique of it, nor was it about showing how barbaric stoning can be. The stoning was simply a medium for darker, sadistic intentions. The movie was about the abuse of power and position by those with vested interests (the mullah), the selfish motives of the husband and how a desire can result in destruction. The main message imparted was about patriarchial and mysogynistic attitudes, how the voice of some (the women in this video) is not always loud enough against those who know how to twist the system. 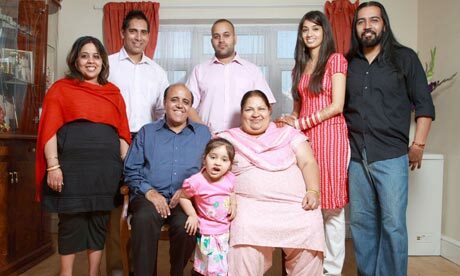 Channel 4’s “The Family” this season are following a Sikh family compromising of parents (Sarbjit & Arvinder), 2 adult sons, Tindy and Sunny (who is married to) Shay (the daugher in law), daughter, Kaki, and son in law, Jeet & toddler Bhavi all living under one roof (the latter couple temporarily living there as Kaki is heavily pregnant with their second child). Many traits inherent in this Asian family seem familiar and wouldnt necessarily be out of place in the average asian family from the Indian subcontinent, be they Sikh, Hindu or Muslim. These are similarities which span across the spectrum, irrespective of religious leanings. A classic example being father Arvind who is oblivious to the dynamics of the kitchen and often beckons his wife without actually using her name. Instead he chooses to yell “where’s my tea!” “I want food” or “you eat like a pig” when he wants her attention. Sarbjit lovingly retorts back, when she isnt half dozing away infront of the TV or grunting at Arvinder’s requests. The boys, aside from son-in-law Jeet, are rarely seen to venture into the kitchen either. But aside from these stereotypes, the family addresses some issues which are pertinent amongst the Asian society, bringing them to the forefront. Shay, their resident daughter in law, has been estranged from her mother who disowned her for wanting to marry Sunny – he was considered unsuitable due to caste differences. This is being outcast/disowned. Intolerance in marriage amongst the Asian community stems from issues such as compatibility, status, reputation and progressive gain. Many marriages are viewed from the lens of maintaining and preserving certain traits which are inherent and apparent within various castes and/or tribes. Some of this caste system has sprung from ancestrial occupations, with labourers, farmers seen as low due to being manual workers, engaging in menial tasks in comparison to landlords and intellectuals who were viewed to be loftier, desirable and often idealised. Some caste differences are upon the insistence of having certain traits or family values which are upheld. Many of those who have caste marriages will admit it would be “easier” to fit in as they would “be similar” to “my own family”. Preservation of caste is taken seriously and in some families is vehemently adhered to. There is family acceptance of anyone not towing the line would be outcase and disowned – which is what Jeet admitted he would do in a heartbeat should his daughter ever go against his wishes in the way Shay had done; nothing is above the family’s code and standards by which its members live according to. Although the “decision” to disown a child is often took to be unanimous, it is often decided and acted upon by the patriarch of the home – this could be the father, uncle or brother (older or younger). Very rarely are mother’s so instinctively willing to disown their child, but as patriarchial family structures go – Asian families are very much organised under this male authoritarian rule. After which the outcasted individual is treated as being dead, but often the dead are (sometimes) remembered and spoken of fondly, the disowned cease to exist – almost as if they had never been born. Some of these ways of thinking are phasing out amongst the new generation however there is little doubt of it disappearing completely whilst the notions of “preserving” ideals of caste, tribe and race exist. Whilst accidentally browsing for something to watch due to having a bout of insomnia (darn flu!) I came across the movie Hard Candy starring Ellen Page, who you’ll probably recognise as being from the movie “Juno”. Hard Candy revolves around Hayley (Ellen Page), a 14 year old girl and Jeff (Patrick Wilson) a photographer, whom she meets offline after chatting to him for a few weeks. They decide to meet up in a coffee shop and amongst some light and blatantly flirtatious and sexually suggestive banter, Jeff takes her home to his flat under the guise of listening to a CD. They chat and mull over some fruit juice laden with vodka. Jeff begins to become disoriented and passes out. This is where the action begins. He wakes up finding himself bound to a chair. There is alot of dialogue used and sometimes its hard to understand and hear what’s been said. However despite this, the movie is fast paced and throughout it you wonder whether Hayley is slightly deranged as Jeff seems like such a pleasant guy and not unlike the sexual predator who grooms underage girls that Hayley makes him out to be. The most excruciating scene is when Hayley decides Jeff needs to be castrated and begins to prep him for the surgical intervention complete with sutures, an ice pack to numb the area and gloves. This is just one of the methods she uses to purge a confession out of Jeff who protests his innocence and pleads with Hayley to get therapy. She refuses to believe him and turns his flat upside looking for any pieces of evidence which point to his paedophilia. Eventually she finds a safe and opens it to discover a photo of a girl who has been missing. The story also involves his love interest, Janelle, who he still pines for despite breaking up with her for a number of years. Hayley uses Janelle to get to Jeff, playing mind games with knowing his soft spot for her. Eventually she threatens to expose him by claiming his attempt to molest her to Janelle if he doesn’t hang himself. With Janelle arriving to the flat under the premise of an incident having occurred (call made by Hayley), Jeff panics and admits he didnt kill the missing girl but his colleague did and he’d give her his name.But Hayley’s already been there and presumably subjected him to the same series of psychological torture leading to his eventual death. She re-assures him of clearing all evidences of his paedophilia after his death so his love interest Janelle would never know. But she leaves all the photo’s out in the open. And flee’s. One thing I wasn’t completely sure of was why was Hayleys’s threat of exposing him to Janelle actually matter to him? After all being a photographer meant he would come across girls of all ages as part of his profression so he could conjure up a number of reasons for why he had photo’s up on his wall. Aside from that, it’s a movie that will make you squirm and at times feel sympathy for Jeff until you realise Hayley was right all along. This is absolutely wonderful. The artist, Kseniya Simonova, tells a story about war, separation, love and faith all through sand art. No one runs away from happiness” says sixteen year old Mitra. She sits alone on a park bench, struggling with her deep abandonment issues and contemplating running away. Her lonely days consist of cooking and cleaning for her father and brother who both abuse and neglect her. Sussan is 20 years old and she has endured so much physical abuse and head trauma that at times she stutters when she speaks. Years of rampant sexual abuse by her own brothers has culminated into a dangerous drug addiction. At an age where most girls are only concerned with make up and clothes, Samira, 14, has been to rehab for the second time. The local police found her unconscious on the street. Nazila, 19, is a juvenile delinquent turned rapper. Although it is illegal for women in Iran to record songs, she says that rap is “how I express myself”. Her deep and meaningful lyrics tell the painful story of an angry woman who resents the society that has discarded her and made her who she is.